Picture your house as a refrigerator. There is a compressor on the outside filled with a special fluid called a refrigerant. This fluid can change back and forth between liquid and gas. As it changes, it absorbs or releases heat, so it is used to “carry” heat from one place to another, such as from the inside of the refrigerator to the outside. Simple, right? Well, no. And the process gets quite a bit more complicated with all the controls and valves involved. But its effect is remarkable. An air conditioner takes heat from a cooler place and dumps it in a warmer place, seemingly working against the laws of physics. What drives the process, of course, is electricity — quite a lot of it, in fact. Central air conditioners and air-source heat pumps operating in the cooling mode have been rated according to their seasonal energy efficiency ratio (SEER) since 1992. SEER is the seasonal cooling output in Btu divided by the seasonal energy input in watt-hours for an “average” U.S. climate. Before 1992, different metrics were used, but the performance of many older central air conditioners was equivalent to SEER ratings of only 6 or 7. The average central air conditioner sold in 1988 had a SEER-equivalent of about 9; by 2002 it had risen to 11.1.The national efficiency standard for central air conditioners and air source heat pumps now requires a minimum SEER of 13 (since 2006), and to qualify for ENERGY STAR requires a SEER of 14.5 or higher. Central air conditioners also come with an energy efficiency ratio (EER) rating, which indicates performance at higher temperatures. ENERGY STAR-qualified models must meet an EER requirement of 12. Air conditioners and heat pumps use the refrigerant cycle to transfer heat between an inside unit and an outside uint. Heat pumps differ from air conditioners only in the special valve that allows the cycle to reverse, providing either warm or cool air to the inside. New efficiency standards for central air conditioners take effect in 2015. As with furnaces, the new standards will differ by region, with greater stringency in the South and Southwest than in the North. New central air conditioners sold for installation in the South and Southwest must meet a minimum 14 SEER; for units installed in the North, the 13 SEER minimum remains unchanged. Air-source heat pumps must meet the 14 SEER minimum regardless of where they are installed. In addition, central air conditioners installed in the hot, dry Southwest must meet a minimum 12.2 EER (or 11.7 EER for larger models). In contrast, cooling performance of ground source heat pumps is measured by the steady state EER instead of a seasonal measure. The ENERGY STAR program’s minimum requirements for ground-source heat pumps are 21.1 EER for open-loop systems, 17.1 EER for closed-loop systems, and 16 EER for direct expansion (DX) units. 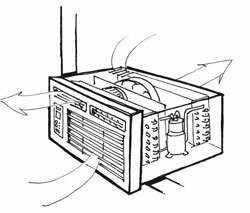 Room air conditioners are available for mounting in windows or through walls, but in each case they work the same way, with the compressor located outside. Room air conditioners are sized to cool just one room, so a number of them may be required for a whole house. Individual units cost less to buy than central systems. Room air conditioners are rated only by the EER, which is cooling output divided by power consumption. The higher the EER, the more efficient the air conditioner. Revised federal minimum efficiency standards for room air conditioners adopted in 2011 will take effect in June 2014; revised ENERGY STAR requirements will take effect in October 2013. Table 5.2 lists requirements for units with louvered sides—the most common type. 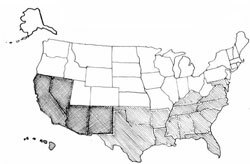 Evaporative coolers, sometimes called swamp coolers, are less common than vapor compression (refrigerant) air conditioners, but they are a practical alternative in very dry areas, such as the Southwest. They work by pulling fresh outside air through moist pads where the air is cooled by evaporation. The cooler air is then circulated through a house. This process is very similar to the experience of feeling cold when you get out of a swimming pool in the breeze. An evaporative cooler can lower the temperature of outside air by as much as 30 degrees. They can save as much as 75% on cooling costs during the summer because the only mechanical component that uses electricity is the fan. Plus, because the technology is simpler, it can also cost much less to purchase than a central air conditioner — often about half. A direct evaporative cooler adds moisture to a house, which could be considered a benefit in very dry climates. An indirect evaporative cooler is a little different in that the evaporation of water takes place on one side of a heat exchanger. House air is forced across the other side of the heat exchanger where it cools off but does not pick up moisture. Both types begin to lose their effectiveness with increasing humidity, because humid air is less able to carry additional moisture. For evaporative coolers to do their job, they must be the right size. The cooling capacity of an evaporative cooler is measured not in the amount of heat it can remove (Btu), but in the fan pressure required to circulate the cool air throughout the house, in cubic feet per minute (cfm). A good rule is to figure the cubic square footage of your house and divide by 2. For example, a 1,500-square-foot house with 8-foot-high ceilings would require a 6,000 cfm cooler. Mini-split systems, very popular in other countries, can be an attractive retrofit option for room additions and for houses without ductwork, such as those using hydronic heat (see the heating section). Like conventional central air conditioners, mini-splits use an outside compressor/condenser and indoor air handling units. The difference is that each room or zone to be cooled has its own air handler. Each indoor unit is connected to the outdoor unit via a conduit carrying the power and refrigerant lines. Indoor units are typically mounted on the wall or ceiling. The major advantage of a ductless mini-split is its flexibility in cooling individual rooms or zones. By providing dedicated units to each space, it is easier to meet the varying comfort needs of different rooms. By avoiding the use of ductwork, ductless mini-splits also avoid energy losses associated with central forced-air systems. The primary disadvantage of mini-splits is cost. They cost much more than a typical central air conditioner of the same size, where ductwork is already in place. But, when considering the cost and energy losses associated with installing new ductwork for a central air conditioner, buying a ductless mini-split may not be such a bad deal, especially considering the long-term energy savings. Talk with your contractor about what option would be most cost-effective for you. Night Breeze is a new home climate control technology designed to save energy in hot, dry climates. It is essentially a powered whole-house fan, air conditioner, and indirect water heater integrated under one control system. In the summer, the system draws in as much cool outdoor air as possible to meet cooling needs — the air conditioner only kicks on if absolutely necessary. In the winter, a water-to-air heat exchanger extending from the water heater supplies warm air to the system. Also appropriate for dry climates, the Coolerado Cooler is an evaporative cooling technology that is 100% indirect. It can offer four to six tons of cooling with an energy consumption of 1,200 watts. Its energy efficiency ratio (EER) is 40 or higher, making it two to three times as efficient as the best conventional air conditioners. Thermal Energy Storage is a technology that is best for simply shifting energy use from peak to off-peak hours. It works by storing energy in ice — at night, electricity is used to freeze water, and during the day, the ice can cool air that is circulated throughout the house. Most cost-effective for people who live in climates that cool off at night and pay more for peak electricity use (e.g., in California), this technology is now available for residential use. Air conditioners take heat from your house and dump it outside. New standards set region-specific efficiency requirements for the North, South, and Southwest.